After almost a year’s wait since the announcement, fans of the cult film “What We Do In the Shadows” will finally get to see the episodic version. 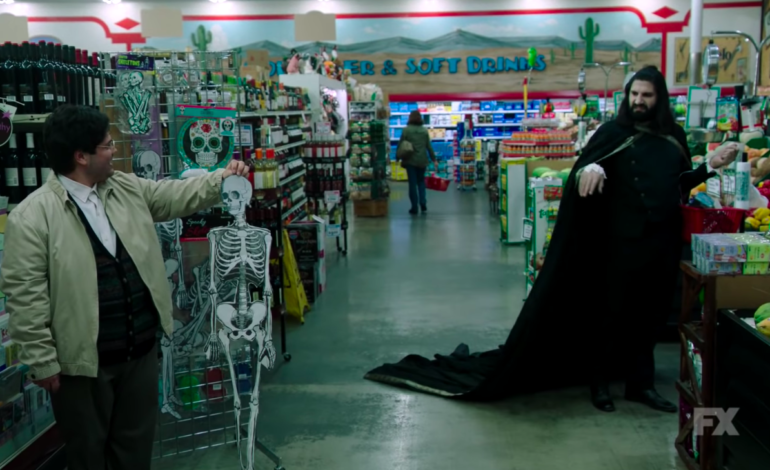 FX revealed the March 27th premiere date in an official trailer for What We Do In the Shadows, a comedy based on the documentary-style film about vampires living their day-to-day lives. Jemaine Clement, who created and acted in the original, has created the 10 episode mockumentary of four vampires, who act more like roommates, who have been “living” together for hundreds of years in Staten Island. The series will feature Matt Berry, Kayvan Novak, Natasia Demetriou, Harvey Guillén and Mark Proksch, who appeared as guest stars in the pilot. As in the film, group leader Nandor The Relentless (Novak) employs methods from his Ottoman Empire days to hold the group together. The other members of the group are Laszlo (Berry), a British fop of sorts, Nadja (Demetriou), a temptress, Guillermo (Guillén), who is a human acting as Nandor’s familiar/servant, and Colin Robinson (Proksch), a different sort of vampire that feasts on human flesh but not their blood. Concerning the plot, the crew receives an unannounced visit from Baron Afanas, their dark lord. This awakens the memory of the group as to why they were placed in Staten Island in the first place: in order to dominate the New World. This sets the crew off on their renewed quest. However, Nandor’s tactics tend to fall short of expectations for a leader, adding to the hilarity. Guillermo will go to almost any lengths for Nandor to turn him into a vampire, and “Jenna” (Beanie Feldstein), a friend of Nadja’s, might also have been turned vampire, as she suddenly has a taste for human flesh. The series will be produced by FX Productions with executive producers Jemaine Clement and Taika Waititi, who directed, wrote, and acted in the original film, along with Paul Simms, Scott Rudin, Garrett Basch and Eli Bush.